from TheWashingtonPost: "Ronald Reagan had an interest in lucky numbers and newspaper horoscopes. Less known is that a certain scholar of occult philosophy had a lifelong influence on the 40th president of the United States. Mitch Horowitz, editor-in-chief of Tarcher/Penguin and the author of "Occult America: The Secret History of How Mysticism Shaped Our Nation," reveals the details. The full article is here. 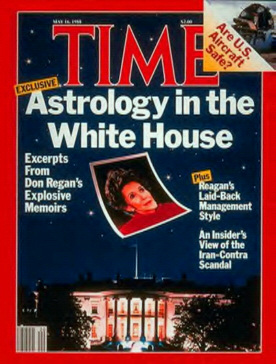 In spring of 1988, White House spokesman Marlin Fitzwater acknowledged publicly what journalists had whispered for years: Ronald and Nancy Reagan were devotees of astrology. A tell-all memoir had definitively linked the first lady to a San Francisco stargazer, confirming speculation that started decades earlier when Reagan, as California’s governor-elect, scheduled his first oath of office at the eyebrow-raising hour of 12:10 a.m. Many detected an effort to align the inaugural with promising heavenly signs. Fitzwater also confirmed the president’s penchant for “lucky numbers,” or what is sometimes called numerology. There was more to the story than the White House let on. In a speech and essay produced decades apart, Reagan revealed the unmistakable mark of a little-known but widely influential scholar of occult philosophy, Manly P. Hall. Judging from a tale that Reagan borrowed from Hall, the president’s reading tastes ran to some of the outer reaches of esoteric spiritual lore. Hall, who worked in the Reagans’ hometown of Los Angeles until his death in 1990, attained underground fame in the late 1920s when, at the age of 27, he published a massive codex to the mystical and esoteric philosophies of antiquity: The Secret Teachings of All Ages. Exploring subjects from Native American mythology to Pythagorean mathematics to the geometry of Ancient Egypt, this encyclopedia esoterica won the admiration of readers ranging from General John Pershing to Elvis Presley. Novelist Dan Brown cites it as a key source. After publishing his great work, Hall spent the rest of his life lecturing and writing within the walls of his Egypto-art deco campus in L.A.’s Griffith Park neighborhood. He called the place a “mystery school” in the mold of Pythagoras’s ancient academy. It was there in 1944 that the occult thinker produced a short work, one little known beyond his immediate circle. This book, The Secret Destiny of America, caught the eye of the future president, then a middling Hollywood actor gravitating toward politics. "I'd heard my parents [Ron and Nancy] read their horoscopes aloud at the breakfast table, but that seemed pretty innocuous to me. Occasionally, I read mine, too--usually so I can do the exact opposite of what it says. But my parents have done what the stars suggested--altered schedules, changed travel plans, stayed home, cancelled appearances." "Emerging from a particularly credulous Southern California culture, Nancy and Ronald Reagan relied on an astrologer in private and public matters--unknown to the voting public. Some portion of the decision-making that influences the future of our civilization is plainly in the hands of charlatans."